McHenry County Board John Reinert has researched how the McHenry High School Board could meet the needs of its students without voters approving the borrowing of $44 million. That is the amount of the bond issue on the November ballot for McHenry High School District 156 voters. Reinert poses shifting students from the McHenry High School District to the Crystal Lake High School District. Crystal Lake High School has fewer students that in the past and could absorb the number that will be served by the $44 million addition proposed in the referendum. There may be other options to the upcoming referendum for the McHenry School District 156 to spend an additional $44,000,000 on repairs and expanding their East and West Campuses. An adjustment in the district boundary line between Crystal Lake District 155 north to Bull Valley Road into McHenry District 156 may be a solution that could save tax payers Tens of Millions of Dollars. McHenry High School District 156 map. Currently the school enrollment numbers are down over 10% in both Crystal Lake and McHenry school districts. 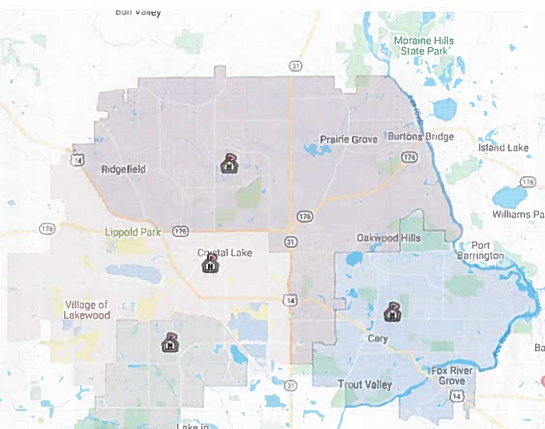 Crystal Lake has 3 high schools including Prairie Ridge High School that is way below capacity. Student population in Crystal Lake High School District 155 since 2010. Possibly even more appealing, Prairie Ridge is located at the Northern end of the district. This could make a boundary move North to Bull Valley Road even less costly for bus transportation. Crystal Lake High School District 155 map. District boundary adjustments to save money and resources have never been researched in McHenry County for as long as I can remember! Speaking with McHenry officials and District 155 Board members along with fellow McHenry County board members and the Regional Office of Education superintendent, this could be a viable solution to avoid spending up to $44,000,000. I would hope the voters deny this request to spend these tax Dollars until District 155 and 156 come up with a solution avoiding this possible unnecessary $44,000,000 expenditure. School Districts throughout McHenry County need to seek alternative answers to costly actions such as this referendum could cause. Steve Willson, what about consolidating these two districts, what would it take? Enrollment is going to keep going down. People leaving state and people having fewer kids. First of all it is not a $44M referendum. It is $44m + interest + closing costs. Has anyone received a document from the district which states the amount of proposed interest? Has anyone received a document from the district of the estimated annual itemized (itemized by principal, interest, and total) debt service schedule for the proposed bonds?…that being new debt if the referendum passes. Less of a deal in this case because apparently current bonds are due to be retired shortly, has anyone received a document from the district of the estimated annual itemized (itemized by principal, interest, and total) debt service schedule for the current bonds?…that being existing debt. Any time you hear bond referendum, you need those documents. If you don’t get them, vote no. Whether you are for or against the referendum you should want those documents. Second, the reorganization information listed above is a starter high level overview to understand the current situation. For a school district reorganization to come to fruition, a number of steps are required, including a reorganization study, and a referendum in both districts. Effective July 1, 1987, Union Elementary District 8, Hawthorn Elementary District 17, & Marengo Elmentary District 140 were consolidated and a new district was created named Marengo – Union Elementary District 165. Effective July 1, 2000, Spring Grove Elementary District 11 and Richmond Elementary District 13 were consolidated and a new district was created named Nippersink School District 2. I have not analyzed this idea at all so I have no evidence either way. I give a lot of credit to John, though, for coming up with this option. If McHenry needs additional space and it has students near where d155 has excess capacity, then this could be a really smart idea for both districts. It certainly bears serious consideration. shifting District boundaries is one idea. Another idea would be for D155 to lease space to McHenry. Who wrote this up for John? Birth rate going down, too. Out of Towner is right, this is an intelligent proposal. And I do applaud Rienert, the crook who paid a Chicago felon to forge signatures on his failed candidate petitions, for advancing the idea. The idea couldn’t possibly have come from Rienert, who was one of Bobby ‘Disneyland’ Miller’s biggest cheerleaders. Just another reason to leave this state. When property taxes exceed a mortgage, there is something sinisterly wrong. Thank you Springfield Democrats and go along to get along Republicans…You are all worthless. You got yours, screw the rest of us! I concur with Out of Towner and Nunda Watcher. Rienert could NOT have come up with such a plan on his own. I’m SO happy Althoff’s RINO pet Reinert got disgraced and took his name out of the GOP primary race w/ Wilcox after it was discovered half his signatures were the forgery ‘work’ of a paid felon from Chicago’s South Side. Obviously Althoff is behind Rienert’s scheme and is being rehabilitated by her. One of the big problems in school district reorganizations is what to do about the pay of employees in the lower paid district, which in this case is McHenry. The biggest payroll cost in a school district by far is the teachers, not the administrators or classified employees (secretarial, aides, maintenance, bus, etc). Although apparently not required by state law, past practice has been to hike the pay of employees from the lower paid district, to the pay of employees to the higher paid district, subsidized for the first few years by a state subsidy which is phased out, leaving local taxpayers responsible for 100% of the annual cost of the hikes after the subsidy is phased out. Another issue is that although McHenry bonds are almost paid off (retired), that is not the case in Crystal Lake. It is hard to believe the ROE Superintendent would not have mentioned these basic reorganization issues. There was not even a ballpark estimate given if one or more high schools could be closed. So how could one say with a straight face that up to $44M could be saved. There was not even an attempt to list the breakdown of the $44M and how a reorg might prevent which of the expenditures. Voters should vote no on the referendum, but for a different reason: the planned debt service schedule has not been released. Who would buy something without knowing the payment plan for that item with itemized interest? The answer is millions of voters during bond referendums for decades. It is the norm, not the exception, in Illinois. Save the money, then pay cash, to avoid the interest costs. While not a perfect plan, it would at least get people to start talking about bond interest. Worse than bond interest, is pension interest on unfunded pension liabilities. And worse than that was legislatively hiking pension benefits while pensions were already underfunded. After the benefits are hiked, they cannot be withdrawn for existing employees and retirees, only future employees, due to the pension sentence in the state constitution. The transparency and understanding of the hikes by taxpayers during the legislative process was awful.